For about $1 of tax per person per year, or a $2 (toonie) charge per use, the Halifax Skating Oval can be sustained, at the highest cost estimates. It could be as low as 50 cents per use. I’m not encouraging this, but if paying for use of the Oval were a last resort, it could be very affordable and definitely worth its value! There’s a big debate on whether or not to keep the Canada Winter Games Skating Oval on the Halifax Commons (CBC, Jan 4 2011). A lot of the public is enjoying the facility, but the worry is the cost of maintaining the Oval after the Canada Games are over. The hope is that business support can be found to pay the costs, rather than increasing taxes or having to charge skaters. However, that’s a political solution. This analysis looks at the business case of keeping the oval if the public had to pay for it. This is the big unknown. The highest estimate I’ve heard is $400,000 per year. It’s probably just fear mongering numbers among those who want to see the Oval dismantled after the Canada Games, but I’ll take that to analyze the worst case scenario and show how it is still quite feasible. The Coast estimates $110,000 a year or a bit above 1/4 of my worst case scenario! Mayor Kelly finally gave a figure of up to $250,000 so my worst case scenario is definitely valid (Chronicle Herald). There is a one time cost of laying down a concrete pad to make the temporary top a permanent one (Mayor Peter Kelly, Metro, Jan 4 2011). Mayor Kelly did not give a cost, but we’ve got $500,000 to use towards it from the cost of dismantling the Oval. The entire oval, surface, landscaping, generators and all cost $2.5M so the new surface alone probably won’t cost much more than the $500,000, if that. Point is it should be mostly offset by the dismantling cost so it’s only the $400,000 annual costs that makes sense. Other costs like staff and lights would be minor relative to this $400,000 estimate, and could be partially offset by rent for food vendors on site, or maybe the City could support that. It’d be a lot less than what it puts towards its community centres and other facilities, that’s for sure! If this cost estimate were wrong, use a more accurate one and do the same math and I’m sure you’ll still see it is a feasible case. A cost of $650,000 a year might well be feasible, as I will show, although it could be $1 or 50 cents if the Coast estimate were right! There are almost 400,000 residents in the Halifax Regional Municipality (HRM). Statistics Canada estimated 398,000 for July 1 2009. How nice and convenient! About $1 in taxes per person! $400,000 can be looked at in context in some other ways. It’s two cheap condos in the local market and 14 average cars at $29,160 US per car (Detroit Free Press)… if neither cost nothing to maintain! In the big picture, spare change, basically. You can debate my estimates, but follow it through to see how little of a difference it would make. $400,000 over 5 months is $80,000 a month. $80,000 a month over 25 days is $3,200 a day opened. $3,200 a day opened over 3 public skates each day is $1,066.67 fee per public skate. At $2 a person, you’d need 533 people per public skate. On a 400m track, that’s 4 people for every 3 metres of the Oval, looking straight across during a public skate. Um, have you seen the crowds at the public skate lately? 533 people is nothing! And this is assuming it’s the same people on the ice during the entire 2-3 hour public skate. The Coast reports there were over 2,000 people skating on the Oval on some days! Using Mayor Kelly’s figures of $250,000 a year, we could run in on $1.25 a use. Heck, you might be able to make money charging toonie skates at the Oval! For reference, Dalplex, the local university rink nearby, charges $3.75 per person over 12 years old and $2.75 per kid under 12. It’s nowhere as big or fun, indoors, and not open nearly the same number of hours. You also can’t do long track speed skating. Now, let’s go the other way and take a straight average of $3.25 per skater at Dalplex (although I doubt there are nearly as many kids under 12 as older people skating). If skaters were to pay the same for the Oval as Dalplex, we could afford a cost of $650,000 a year towards maintaining the Oval. But Dalplex is nothing compared to the Oval, of course. Talk about good value for your money! At $2 for an hour of skating or more, or even $3.25, outdoors, it’s great cheap entertainment that’s very social and gets people out of the house during winter when it’s so tempting to stay indoors. Think, what’s the cost for a swim or a movie or a drink these days? I had a chance to talk to Mayor Kelly a few nights ago as he walked by the Oval. My response to his uncertainty on costs was to figure it out and then, if it weren’t affordable, to take a poll to see how much people would be willing to pay. If it weren’t enough, see how much it would offset and if the reduced costs to the City would be more manageable. So let’s try it here. The long skating club would also be chipping in for costs to use the Oval, at a higher rate as they don’t draw the same crowd but uses the same resources, like zamboni for cleaning the ice. They’d be paying more for privileged access essentially. At roughly break even or even small profit, the City could throw in passes for the less privileged as it hands out financial aid or as it delivers various types of support programs. Talk about getting political goodwill! Overall, you’re looking at something that could gather gate attendance of about 200,000 a year. While that wouldn’t be 200,000 unique people as some will use the Oval quite often, it’s still a very high figure for a relatively small cost were the Oval to be funded. Think about what can you bring to such a vast segment of the public for such a small cost at $2 or less per person? Come on, business and politicians, you know you wanna! Outside of actual costs, there’s a thing called opportunity costs, which is the cost of what else something could be used for. Where the Oval sits, you’d lose one softball or baseball diamond on what opponents against the Oval calls a seasonal facility. Um, last time I checked, baseball wasn’t year round. There are also plenty of diamonds that I rarely see all used. It’s only that way cause these people don’t play over a greater number of hours. They’re not going to miss one diamond. Learn something from the hockey players who get up pre-dawn for their practice and games, would ya? Speaking of hockey players, while the rinks may lose out on public skate business, they can reap at least some of it back in hockey ice time. I constantly hear how there is a lack of ice space for recreational hockey players. They play at crazy hours in distant places, some of them, because that’s the only places and times they could get the ice. Their needs could be served with the Oval opening up more rink ice time. Baseball versus hockey, eh? I believe hockey is the Canadian national sport. Give it some precedence. And even with the Oval taking up space on the Commons, there is still plenty of space remaining to smoke weed there. I almost can’t walk through the Commons when the weather is warm without whiffing some weed coming from somewhere nearby. Don’t forget. It’ll cost an extra $500,000 to dismantle the Oval and re-landscape if we don’t keep it. It’s not like it’s “free” not to keep the Oval. There’s a cost to not keeping it, but do the opponents ever talk about that??? Some of the chillers that keep the Oval ice cold were destined for other rinks after the Canada Games. However, the Coast reports that the chillers cost just $300,000 in total out of the $1,200,000 alloted, which is enough to buy far more chillers than we have room for! The Halifax Commons has been used for big summer concerts in the past few years. However, there is plenty of space for that. It’s not like it gets so filled we couldn’t spare the space for the Oval during those concerts. No loss there. How much health care bill do you think you’ll save by having all these people exercise on the Oval during winter? Sure, some would do other exercise anyways, but many would not. We do have an obesity epidemic in this country right now for a reason, you know. A summer use for the Oval? During the same conversation I had with Mayor Kelly Monday night, I asked him about the potential use of the Oval as a recreational track. Not one where the elites would practice and race on. Just a recreational one because we don’t have enough of them around HRM, either. I know that for sure from experience. Mayor Kelly said it wasn’t possible because of the materials underneath. However, others seem to disagree. Andrew Feenstra of Cyclesmith thinks it could be possible, or have a track for rollerblading (less impact), or play volleyball on the infield (savetheoval.ca petition website). 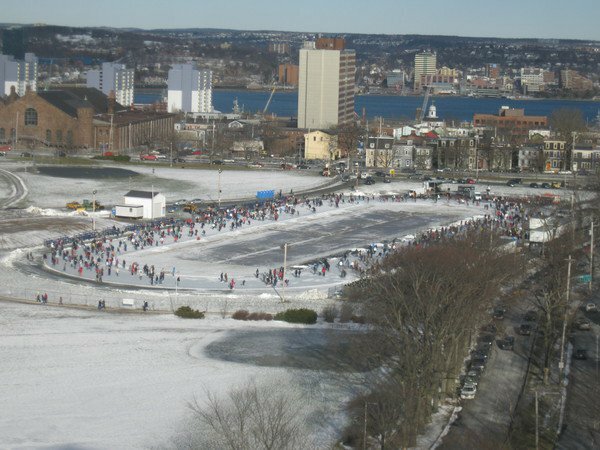 There is no good reason to dismantle the Halifax Skating Oval after the Canada games. Costs are affordable and exchange of space is definitely worth it without any real opportunity cost to do so. The social benefits of exercise and safe fun for everyone, especially some teens who might hang out in sketchy places otherwise, is not even included in the analysis that proves the worthy value of the keeping Oval. Really, why is there even a debate? I’m still hoping sponsors can be found, in which case, perhaps we can even do the donation weekend fee structure where on the weekend, people would pay $1 a use or a can of food, all of which would go towards some charity. On the money side, we could have each month’s donations towards a certain charity or something. Wouldn’t that be a nice way for people to give back? Just an idea, you know? There’s a famous saying people like to quote from Field of Dreams that If you build it, they will come. Well, we have built it. They have come and continue to be coming in droves. Now are we going to tear it down? C’mon, HRM! Where’s your Commons sense? Thanks for this!! It’s this type of analysis that everyone wants to see. I really like the comment about summer use and I think that rollerblading is a great idea and that Halifax definitely needs a rollerblading surface! Ottawa has similiar models for outdoor skating with the Rideau Canal, their speed skating Oval near Carleton U and several outdoor ice rinks. I feel that Haligonians are surprised by the excitement for more outdoor rec opportunities when really, in other cities this is a common thing! I think the lease for outdoor vendors around the oval is huge and will provide a good offset to operating costs as well as ice rental for speed skating programs. And I would push for a winter festival in the Commons centered around the Oval just like they have in Ottawa! Why does Halifax only have to be a tourist destination in the summer? Our Winters are beautiful! You should post this analysis to the Save the Oval FB site in their discussion section! Thanks, Lorie, for the supportive comments and sharing further ideas and perspectives on what other cities have. The more information we know, the more it becomes clearer the value of this Oval to the HRM and its residents and why we should keep it. The skating oval could also be used by the city schools to enhance their physical ed. programs. Yes, great idea! I’m sure one day soon we’ll be submitting ideas for the Oval’s alternative uses rather than mourning its loss. So much potential! Absolotely keep the skating oval. It is a wonderful and needed addition to the city.It will help make our city a world class city. Yes, it will! Thanks for your comment. Fully rediculous that it was ever even contemplated to dismantle such a valuable asset. As it’s often asked, “Why are we even having this converstaion?” applies fully to this topic. Now let’s all go to the Midtown for a cheeseburger burger and the best Keiths in the province. I totally agree, and don’t like it the politicians are still trying to hold us all hostage on the fate of the Oval after the games, in a bid to “play poker” and bluff to try to get more $ to support it. The Oval is now closed for Canada Games, with supposedly no plans for re-opening it after the games, according to an email sent out. Paying $2.00 to skate the oval is reasonable compared to what some rinks charge(not saying names) between $3.50 and $5.00 and you get to skate around in 1 rink not a huge oval. Being outside just adds to it and makes it more fun anyways. Completely agree, Nick. Just about every rink I know charges at least $3.50 for most of their public skates. Not the size of the Oval, nor the air quality! well, it is november now and the costs are skyrocketing. Still think it is worth it? Totally. Perhaps you should learn to apply your concept of economics for the arts towards public property, arts student. We could ask the same of some “arts” and arts institutions.